NASA partnered with Orbital Sciences to test a new space delivery vehicle. The Antares A1 rocket was successfully launched on April 21 from NASA’s Mid-Atlantic Regional Spaceport at Wallops Island, Va. A week earlier we were involved in another aerial mission to gather images to be released to the media. That photo flight started in Manassas, Va. the day before with rigging Bussmann Aviation’s helicopter with a specialized gyro mount in the rear compartment. That system does a great job of smoothing out the motion of Alt Gobo’s Panasonic HPX170 P2 HD camera. In addition to the mount, three containers of jet fuel were stored to give the aircraft a little more range. 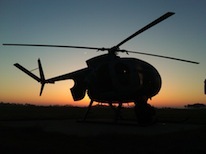 The crew flew to Chicoteague, Va. and secured the helicopter for the photo mission that began before dawn the next day. Just after sunrise the crew lifted off and did several orbits of the launch pad. The Antares A1 rocket has been on the beach-side pad for a few weeks. The still photos and video material was processed and made available to the media the next day.